Four student-athletes will be taking an active part in the 2017 Rose Parade, representing the LA84 Foundation as part of the City of Los Angeles’ float on January 2, 2017. The youth ambassadors will ride with and walk alongside Olympians and Paralympians atop the “Follow the Sun” float, created in partnership with the Los Angeles 2024 Olympic bid and the Los Angeles Tourism & Convention Board, and will embody L.A.’s commitment to sport and healthy living. The float will also emphasize L.A.’s rich Olympic history, including the successful 1984 Games that funded the establishment of the LA84 Foundation. Inaugural members of the LA84 Student Athletes in Motion (SAM) program, the four ‘SAMbassadors’ are youth aged 11 to 18 who are active in sports, civically engaged and personify LA84’s commitment to the transformative power of sports and represent the next generation of athletes and leaders. Established in 2016, the SAM program brings together youth from all corners of Los Angeles County to serve as an advisory board and offer guidance on grants, programs and activities. 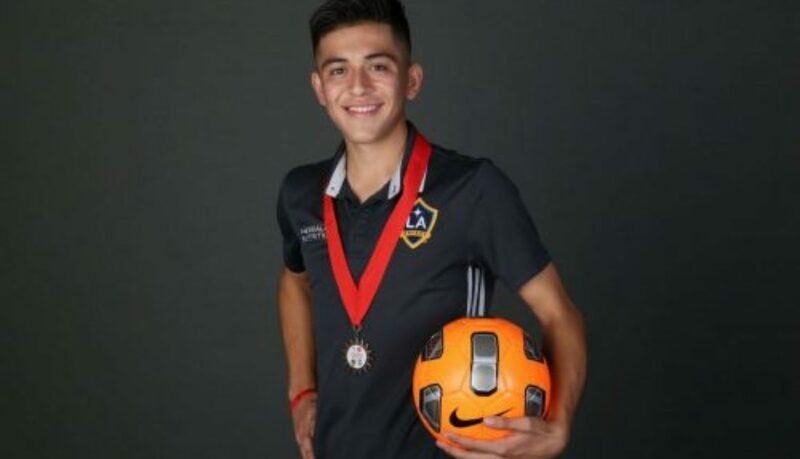 “I can’t wait to join hundreds of millions across the world in watching these student-athletes, the future difference-makers of Los Angeles, be able to represent their city and the Olympic movement. All of our SAMbassadors embody this year’s Rose Parade theme; they have transformed their lives and are inspiring positive change in their communities through sport. Participating in the Rose Parade is an incredible opportunity for these emerging young leaders to create their own ‘Echoes of Success’” said Renata Simril, President and CEO of the LA84 Foundation. The four SAMbassadors riding the float include 18-year-old SaraJoy Salib, water polo athlete and Outstanding Academic All-American award recipient, 17-year-old Rafael Lopez, LA Galaxy Special Olympics Southern California Unified Team member, 14-year-old Kayla Novak, a cyclist, tennis and track & field athlete at Redondo Union High School and 11-year-old Ezra Frech, a record-holding track & field parathlete. “I am proud to be a SAMbassador because it has opened doors to new experiences. I’m also happy to be riding the float because it’s a once-in-a-lifetime chance to be able to participate in such a prestigious parade!” said Lopez, a senior at Huntington Park High School. 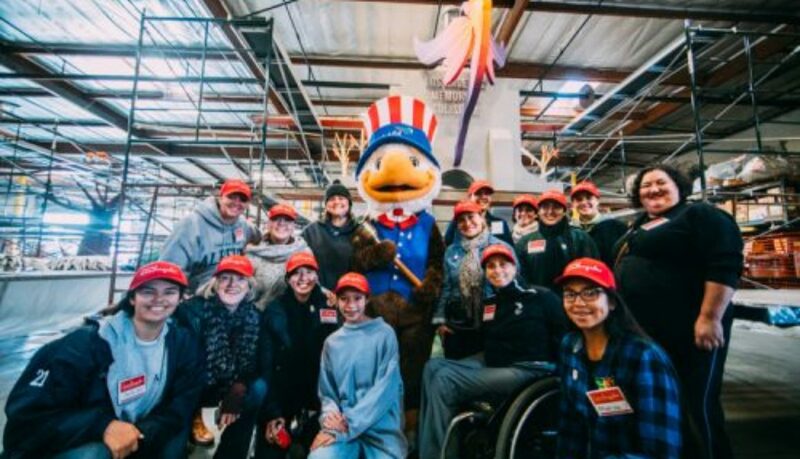 There are currently 27 SAMbassadors, many of whom will take part in decorating the float on the morning of December 27, 2016 at Fiesta Parade Floats in Irwindale, Calif. The SAMbassadors are actively involved in the foundation’s community presence, including conducting a panel at the 2016 LA84 Summit, volunteering for LA84 and grantee events, and meeting quarterly to share ideas on and plan ways to positively impact youth sports in Southern California. The Olympians and Paralympians who be riding the float along with the four youth include Nadia Comaneci, 1984 Olympic gold medalist Bart Conner, Lex Gillette, Howard Shu and Candace Cable, all of whom have been involved in recent LA84 summits and convenings. The “Follow the Sun” float will include a replica of the Los Angeles Memorial Coliseum, which hosted the Opening and Closing Ceremonies for the 1932 and 1984 Olympic Games. Three Los Angeles-area Olympians – 1984 Olympic gold medalist Greg Louganis, Janet Evans and Allyson Felix – have been named the 2017 Grand Marshals of the Tournament of Roses. Sam the Eagle, the official mascot of the 1984 Olympic Games, helped to introduce the three Grand Marshals in November at a ceremony hosted on the Tournament House lawn in Pasadena. Originally known as the Amateur Athletic Foundation, LA84 was established using a portion of the surplus of the 1984 Games. A youth sports non-profit, the foundation has served over 3 million youth and trained over 80,000 coaches across the eight counties of Southern California since 1985. As a legacy of the 1984 Olympic Games, the LA84 Foundation continues to be a nationally recognized leader in support of youth sport programs and elevating the importance of sports in positive youth development. LA84 seeks to provide an opportunity for every child to participate in sports and experience the wide range of positive outcomes associated with youth sport participation. Since its launch in 1985, LA84 has invested millions in the communities that supported the Games, reaching more than 3 million youth throughout Southern California, from Santa Barbara to San Diego County. 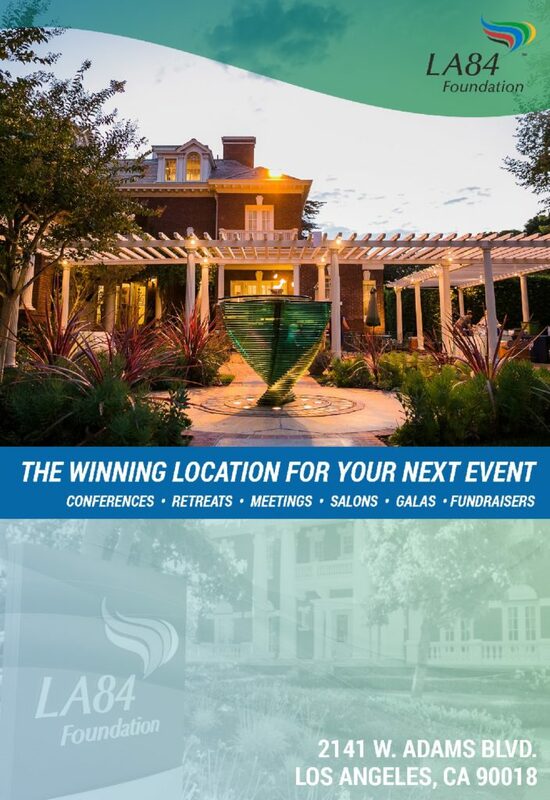 The LA84 Foundation continues to promote the spirit of the 1984 Olympic Games by convening and engaging local, national and international audiences about the role of sport in society, and the impact of the Olympic Games on host cities, especially as we look ahead to the 2024 Games. 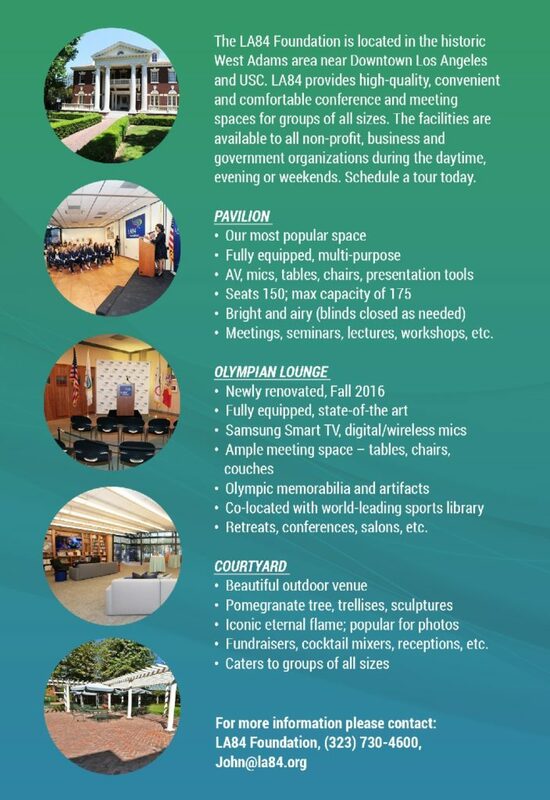 LA84’s headquarters is located in the historic Britt House near downtown Los Angeles, where it houses meeting facilities and the world’s premier sports library. For more information, please visit www.la84.org. 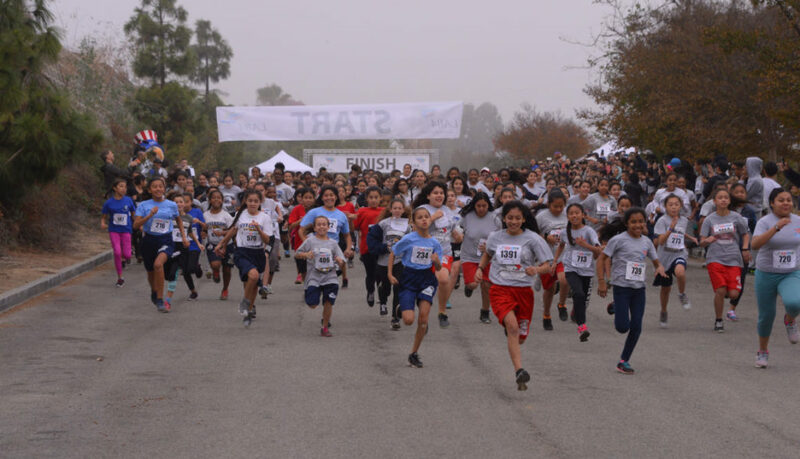 Nearly 1,000 Los Angeles area middle-schoolers ran a two-kilometer race at the 2016 LA84 Run4Fun Festival at the scenic Elysian Park on Saturday, December 10. Check out the best sights and sounds from the morning of the race. Undoubtedly, Los Angeles has top-grade football bones. High schools such as Long Beach Poly and Dorsey have long been hotbeds for future NFL talent. The LA84 Foundation, which finances youth sports with profits leftover from the 1984 Summer Olympics, has helped finance 14 tackle football programs in the region. 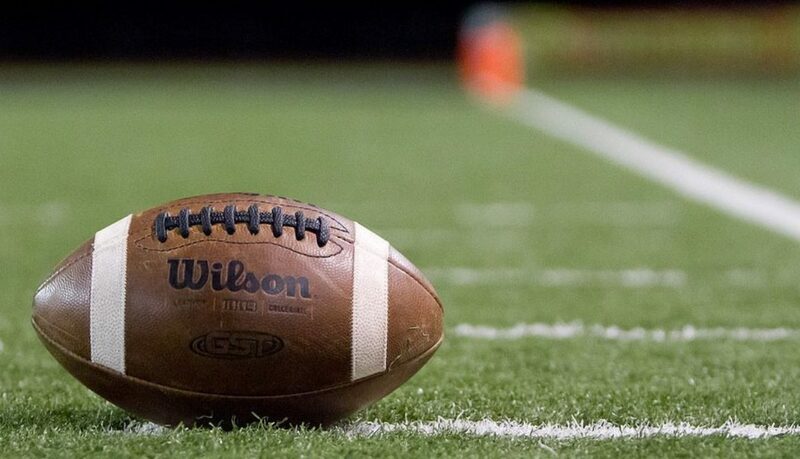 A recent survey from the foundation showed the rate of teen participation in football is roughly twice the national average. Written by Matthew Futterman, who has also written a book about 1984 gold medalist and Olympic pioneer Edwin Moses, the article dissects the Rams’ first season back in Los Angeles. The full article can be found here: http://www.wsj.com/articles/the-nfls-sequel-in-l-a-flops-early-1481649775. Nearly 1,000 Los Angeles area middle-schoolers ran a two-kilometer race at the 2016 LA84 Run4Fun Festival at the scenic Elysian Park on Saturday, December 10. 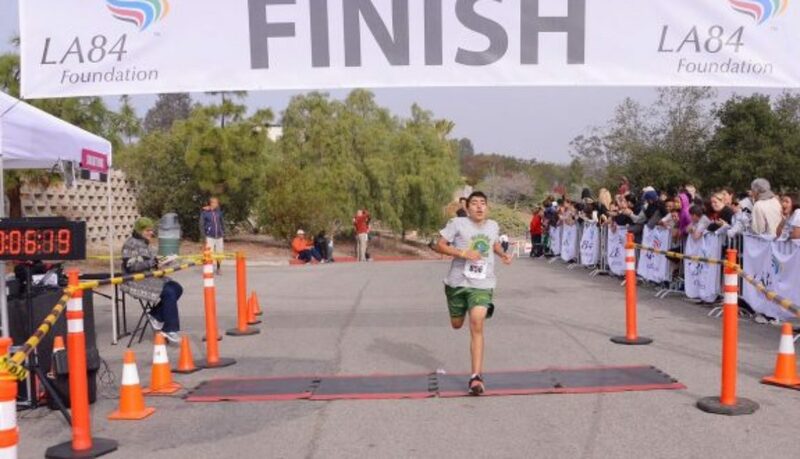 Students from across the Los Angeles area, from the West Valley to Orange County, competed in one of six races, one for each gender and for grades 6, 7, and 8. The event kicked off with a speech from LA84 Foundation & CEO Renata Simril, who praised the racers for their hard work in training since October for the race. Sam the Eagle, the official mascot of the 1984 Olympic Games in Los Angeles, announced the start of the opening race, the Girls’ 6th Grade competition. On a foggy morning, the athletes ran a deceptively tough course that started out as a downhill, but had a final ascent to the finish line. 2016 was the second year Run4Fun was hosted at Elysian Park, with 2015 being the inaugural race. LA84’s Run4Fun program spans 10 weeks during the fall and introduces middle-schoolers to distance running while providing coaches with benchmarks and drills to teach their students the values and benefits of running. The Run4Fun Program has been a staple of LA84 Foundation programming since its inception in 1987. 2016 marked the 28th edition of the Run4Fun Festival, with multiple generations of Angelenos staying fit and experiencing the incredible benefits of distance running, both on and off the course. LA84 also offers swimming, diving, water polo and synchronized swimming through its Summer Swim program, and multiple other sports through its partnership with LAUSD’s Beyond The Bell program. “Running is the focus for now, but it’s so valuable since you’ll need it for every sport LA84 has to offer,” Medel added. See more content and photos from the race below and on LA84’s Twitter, Instagram and Facebook accounts. 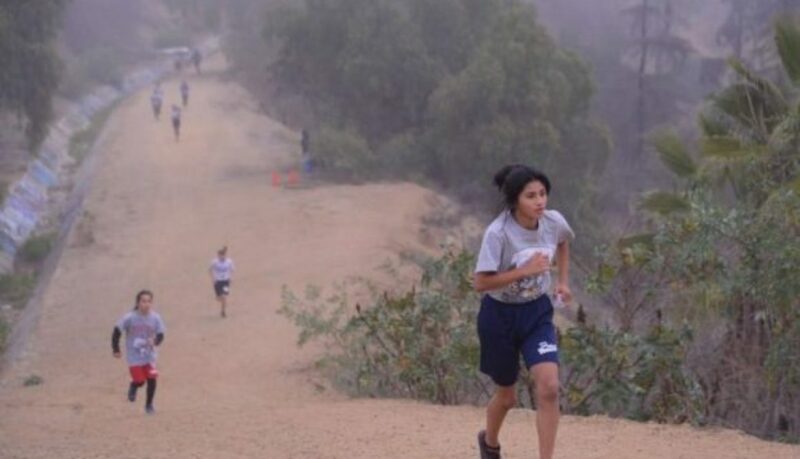 There are many great reasons for kids in Los Angeles County to run. They can run to stay fit. Run to be healthy. Run to spend more time outdoors. Run to create structure. The list is a long one. But what is the simplest, but perhaps best, reason? To Run4Fun. On Saturday, December 10, the LA84 Foundation presents the 2016 Run4Fun Festival in Los Angeles’ scenic Elysian park, adjacent to Dodger Stadium. Nearly 1,500 middle-school student athletes representing 32 area schools will compete in two-kilometer races, beginning at 9am. The Run4Fun Festival is now in its 28th year – and its second year at Elysian Park. This year’s Run4Fun Festival features six races, one for each gender and for grades 6, 7, and 8. Medals will be awarded to the top five finishers in each race and a trophy will be given to the top-finishing school in each race. Taking place near the Los Angeles Police Academy, families and friends at the festival will be cheering on youth from schools across Los Angeles County, from Long Beach to Granada Hills. 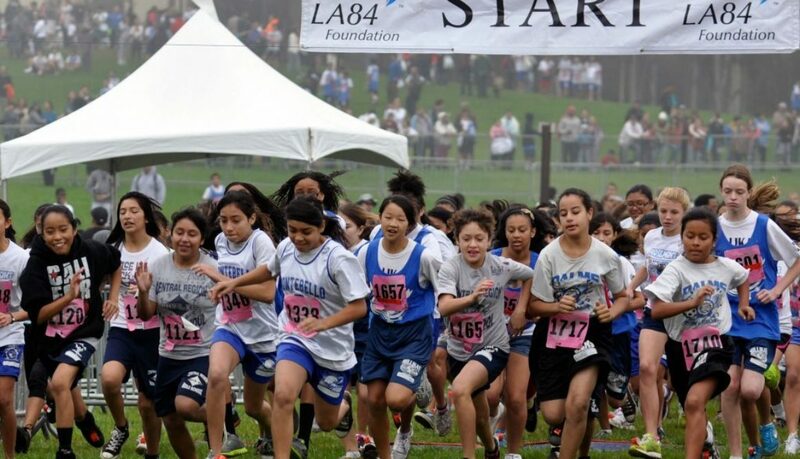 The festival is a culmination of LA84’s Run4Fun Program, which introduces middle-school aged youth to distance running. 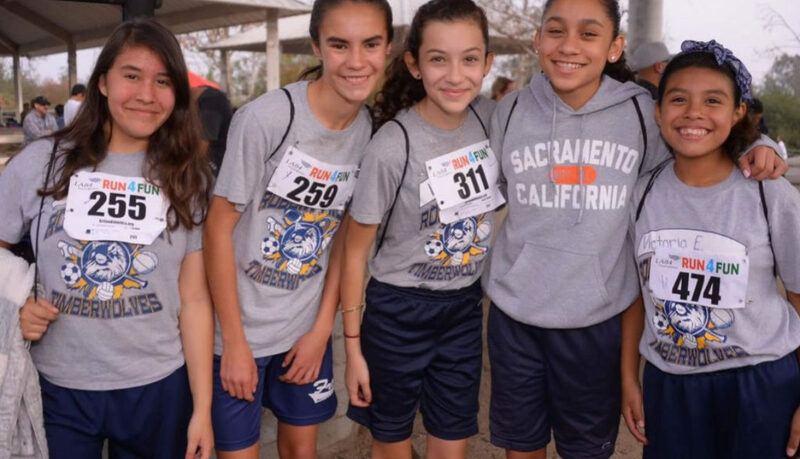 The biggest middle-school cross-country program in the nation, Run4Fun takes place over 10 weeks in October through December, and combines physical education classes and after-school sessions with the primary goal of “TLC” – teaching, learning and competing. LA84 provides participating schools with guidelines for a program structure, online training resources, and transportation to the annual festival, all free of cost. Sam the Eagle, the official mascot of the 1984 Olympic Games in Los Angeles, will also make an appearance at the festival. Run4Fun is one of the wide variety of programs presented each year by the LA84 Foundation. This year, the Foundation hosted leaders across the sports world at the 2016 LA84 Summit, established a student-athlete ambassador program titled the SAMbassadors, and saw over 2,000 youth take part in its 31st annual Summer Swim Program. LA84, the living legacy of the 1984 Olympic Games, is a nonprofit that serves the youth of all eight counties of Southern California in order to change and build lives through the power of sport. Supporters and partners for the festival include Councilmember Gil Cedillo, who represents Council District 1 of Los Angeles, and LAUSD Beyond The Bell, a program funded by LA84. On an afternoon like any other at Holly Park in South Los Angeles, it was these words that were imparted from an old man to a boy entering his second year of playing football. The man’s identity will forever be a mystery, but that boy was Caylin Moore. He’s been enduring, and achieving, ever since. At 6:30am on the morning of Sunday, November 20, Keith Johnson began screaming as he drove down the 110 Freeway in Los Angeles. Johnson, the executive director of Falcons Youth and Family Services, a nonprofit that provides free or low-cost football programs to at-risk children in South LA, has received one-too-many somber phone calls about the tragic fate of a former player. But this was different. This news came on the radio, and it was that Moore had been named a 2017 Rhodes Scholar. 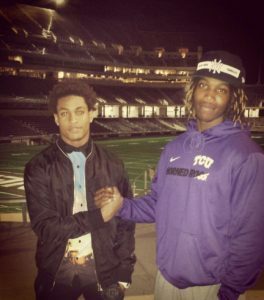 For Moore, a senior safety on the Texas Christian University football team, the achievement is momentous. Life-altering really, as Moore will head to Oxford University in England for the next two years to study public policy. For Moore, it’s not just an opportunity to learn among the world’s best and brightest, but the next step in paying it forward to the Southern California community he calls home. “When you take the elevator to the top, you make sure you press the No. 1 button to send it back down,” Moore said. His words are anything but hollow; few know the struggle on the proverbial ground floor more than the soft-spoken 22-year-old. Moore grew up encountering domestic abuse. When he was 6 years old, his mother, facing tireless verbal abuse and constant threats of violence from her husband and Moore’s father, was forced to move he and his two siblings out of their five-bedroom home in the eastern Southern California suburb of Moreno Valley and to the South LA city of Carson. From there, Moore and his family of four still lived in fear from his father, who would stalk and intimidate the family long following their physical and legal separation. That chapter only came to an end when Moore’s father killed his live-in girlfriend in 2009. Louis Moore is currently serving life in prison. In 2004, another event turned Moore’s life on its axis. This was when Taylor-Moore brought Caylin and her younger son Chase to the park to sign them up for football with Falcons Youth and Family Services, an organization that has been a grantee recipient of the LA84 Foundation. At the same time he flourished on the field, Moore still faced the problem so many youth in low-income communities must grapple with: life without a father. While Falcons provided almost all of its participants with jerseys, cleats, equipment, post-game meals and other items they would otherwise be unable to afford, the true value was in the life lessons Johnson and his staff taught through sport. 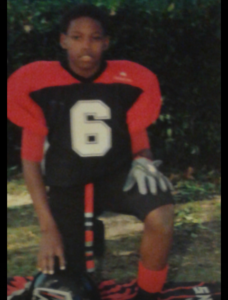 Moore soon became involved in Falcons’ MIT (Men in Training) program. Falcons staff would take the football players to Dodgers games, the beach and on other activities to show the youth a world outside the insulated streets of South LA and give them goals to achieve through academic success. For the Moore family, Falcons soon become a family affair. Chase followed his brother onto the football field. 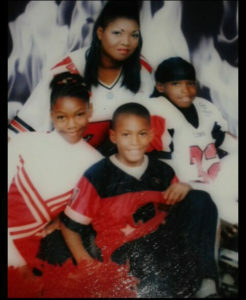 Moore’s sister, Mi-Calynn, became a cheerleader for the youth football teams. Ms. Taylor-Moore started a summer conditioning camp for the teams in order to keep the kids active and safe during the months they were out of school, and later became the first female coach in the history of the Snoop League. 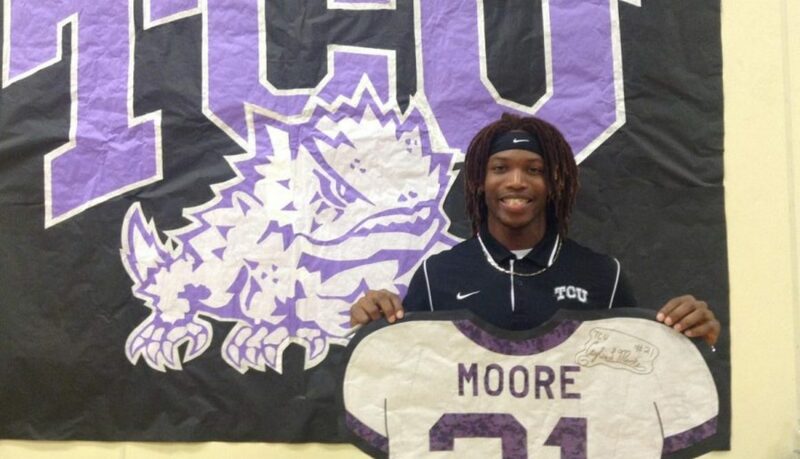 After graduation came a full scholarship to play football at Marist College, and in 2015 Moore transferred to TCU for a chance at playing college football on the highest level. In the classroom, he earned a scholarship in 2014 to attend the Fulbright Summer Institute in England before being named a 2017 Rhodes Scholar in November, with Johnson writing letters of recommendation for both awards. With a father in prison for life, a mother being a victim of domestic abuse, and a daily environment filled with drugs, gangs and crime, Caylin Moore was almost set up to become a statistic. Yet, sports and the support it brought helped flip the narrative. “In an environment where we had gangs and crime and poverty all around us, we had a diamond in the rough at that park during the hours of six to eight o’clock during football practice,” he said. Learn more about Falcons Youth and Family Services here.